From the Hancock County Courthouse, travel southwest on Hwy 22 for approximately 7.3 miles until you come to Pearson Chapel Road on the left. Turn left onto Pearson Chapel Road, and go 2.6 miles. 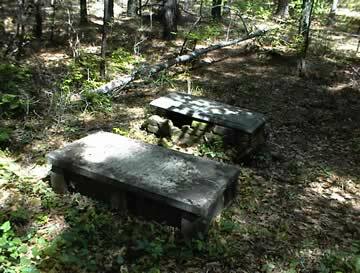 The cemetery is on your right; walk approximately 285 feet into the woods to the cemetery. Aged 2 yrs and 4 mos. Birth date and d/o Jeremiah Pearson, per Carolyn W. Stembridge. Grave was once decorated by concrete lamb, but it has been removed. Aged 1 year, 10 months. The Lord gave and the Lord hath taken away. Our precious boy. Birth date, s/o Jeremiah Pearson, per Carolyn Waddell Stembridge. Definitely 4 graves marked with rocks, with 2 possible additional graves.